Indian Credit Card users witnessed massive Skimming Fraud with their Card being present in their own wallet purchases were made in Spain, South America etc. We wrote to the RBI to curb this menace. The Consumer Friendly and Pr-Active institution – Reserve Bank of India mandated that each and every Credit Card issuer give a liberty to the Customer to either Enable or Disable International Spending. Further, if International Spending is enabled, the Consumer must have a choice to set his own Credit Limit. HDFC Bank Ltd, India’s Largest Credit Card Issuer put its IT department on an emergency work and was able to give a choice to its Customers [Enable / Disable International Spending]. Today we’ll walk you through the same process. Once you log in to your HDFC NetBanking. Choose “Credit Cards” Tab on the Top and “Modify International Limit” on the Left Hand Side. Then a Drop Down Menu is visible as shown below from within which you can pick the Card on which you want to set limits. If you do not use your Card for any International Transactions [Online or while Visiting other Countries], then we Strongly Advise you to Disable International Usage as shown below. If you disable – your credit card will be disabled for usage at International location merchant outlets, International ATMs and International shopping websites. 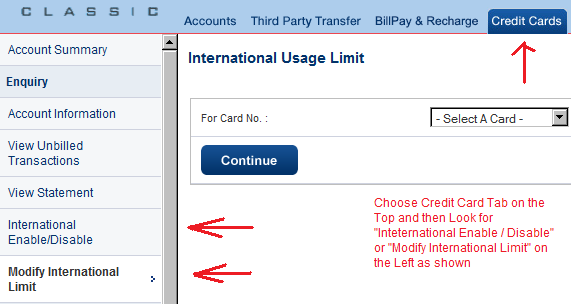 How to Set Credit Limits for International Usage on HDFC Cards ? Some customers like us use Credit Cards out of India as well. So we need to secure it by setting limit which is well within our limits. Note – The International Usage Limit can not exceed the total Card limit and you need to enter values in mutiples of 1000. The Credit Limit on one of our card is Rs 75,000 and to walk you through we set a limit of Rs 2000 for international spends as shown below. We received a One Time Password on our Mobile and we are supposed to enter this on the online Banking interface to authenticate as shown below. This entry was posted on Tuesday, December 24th, 2013 at 1:05 pm	and is filed under HDFC Credit Card.